This was to be my first flight back with my original instructor, back from a holiday, it would be nice to not have to go through the introductions – though having not flown with them over the last 4 lessons, it wasn’t going to be like jumping back in a plane with someone who fluently knows how you fly and what screw ups you regularly make……… Still at least we were going, historically me and this instructor have spent more lessons drinking coffee, than flying. And it nearly got cancelled right from the off. With cloud levels at around 1800ft, one set of my notes suggested I hadn’t done Climbing and Descending Part 2 – there was no hope of that with less than 2000ft to the cloud base. Grrr to my previous instructor not writing stuff up properly and rushing into his next lesson 😉 Still we sorted it and the lesson was on. 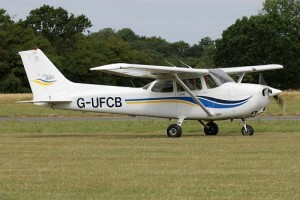 Flying G-UFCB (Charlie Bravo), again…… I quite like it now, but it’s spluttery engine drives me absolutely mad. It won’t start, it starts and then you take the power out below 1000RPM and it plunges into a spluttering stall. Keeping his post short, we would be attempting to do 30 degree turns. When asked what instruments we’d be using I got to Attitude Indicator and blanked: This is becoming a joke, it’s the second time I’ve forgotten the name of this instrument in a briefing. Charlie Bravo was on the side of a taxi way rather than in parking, but other than that nothing exciting to write home about. Radio call for taxi clearance was clear but ATC decided to give me not just a holding point to taxi to, but also the runway number………which I then forgot to read back. Damn it! For power checks into the wind I decided I was most important and planted the plane square in the middle of the holding point area (into wind of course), kind of blocking anyone else who may want to come past. I’d do the take off, so with a departure call and clearance for take off exchange with ATC (remembering to read back the runway this time). Lined up on the white line, full power on…… My instructor might say otherwise but I was very happy with how straight we stayed as we ran down the runway. 65 Knots applying a little back pressure to get it up and then into the climb at 80 knots. The wind was strong and worrying more about flying an accurate airspeed, I was watching my instruments more than the outside world (cue ‘telling off’ number one). I looked up on cue, I had a quick look around and then promptly repeated my mistake and went back to flying instruments this time watching the artificial horizon and the airspeed – we climbed at a perfect indicated airspeed of 80 knots, but the wind was putting us all over the place and the lag on the instruments was probably making me look like I was chasing the impossible. When you first learn, you change gear based on a visual cue of the RPM gauge and you constantly look back at the speed indicator……….some lessons later, you change gear on the sound of the engine (thus keeping your head up) and you know your speed almost from visual reference & throttle position of your foot. The same thing I think is going to apply to flying, simulators don’t give you a good feel for engine noise – so you lean on the instruments. It’s going to take time to get use to what 2200 RPM sounds like and what the attitude looks like for an 80 knot climb. So up we climb…….and true to historical form, overshoot (cue ‘telling off’ number two). I anticipate leveling out a hundred feet early – but on my first climb of the day I’m not being absolute on the flight controls to stop the ascent dead, I’m slow on adjusting the power and take an age before I get to trimming it up. Result, it’s taking the equivalent of 250ft (~30 seconds) of unwanted climb before the plane is settled level, hey presto we’ve net overshot the desired altitude. Arrrh!! I’ve made a mental note now: Start Leveling out 300ft early!!! To hell with what the book says, I’d rather begin to level out sooner and hit my mark than keep overshooting on climbs, I don’t do it on descents so it’s the effect of having power and not forcing the nose to level for that amount of power, that’s causing the headache. With the clouds sat at under 1700ft now, this lesson was going nowhere, another 500ft free from cloud or a better horizon and this would be on, but with the horizon being almost non-existent today it was game over. We turned back to the airport and made a right base entry (rather than flying the standard left-turn circuit). 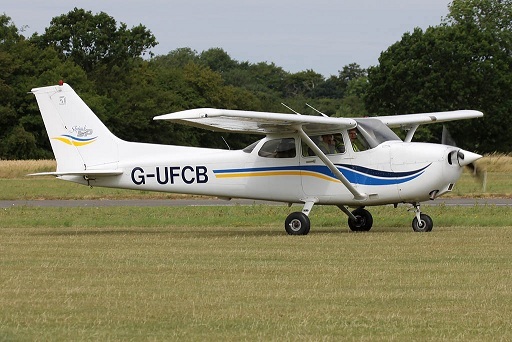 Turning would have to wait for another day…….. 2o minutes flying in the log book though (it all counts!). This entry was posted on Sunday, October 30th, 2011 at 5:00 pm by PHC	and is filed under Actual Lessons. You can follow any responses to this entry through the RSS 2.0 feed. You can leave a response, or trackback from your own site.